Once again this year, PSU will host a one day event: Spotlight on Faculty. It's a time when faculty can share with one another some of the ways they are using Technology in the classroom. It's difficult to keep abreast of all the choices that are out there, and even more difficult to know which are worth your time. 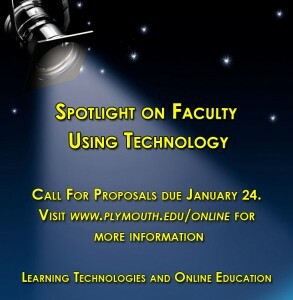 If you are using technology in your classroom, we encourage you to submit a proposal. And for those of you not inclined to speak about your use of technology, please plan to attend. There really are a lot of very interesting and dynamic uses of technology at PSU, but most of us simply don't know about them. As you know, PSU has made the decision to use Moodle as our new Learning Management System. If you've never seen Moodle, the video below will give you an introduction to Moodle and some idea on what your Moodle courses could look like.